Noah Gragson and Justin Haley will lead the field to the green flag. It’s a short 150-lap event in Phoenix, Arizona. Green flag, Grason wins the race to the new turn one. They fan out behind him. Harrison Burton is looking under Haley for 2nd. Haley wins that battle on the top off turn two. Lap 20, Gragson leads Harrison Burton by over 3 seconds. Brett Moffit is on the bumper of Burton as they race through lap traffic. Tyler Ankrum just cut the entirety of the dog leg. He makes it three wide into turn one with a lap car on the bottom. Ankrum cuts across the nose of the lap car and spin himself. He wasn’t quite clear. Ankrum slides up the track and collects Todd Gilliland. All three trucks spin and the caution is out. Gilliland made light contact with the wall. Green, they run side by side into turn one. Moffitt noses ahead on the top and completes the pass! New leader, Brett Moffitt! 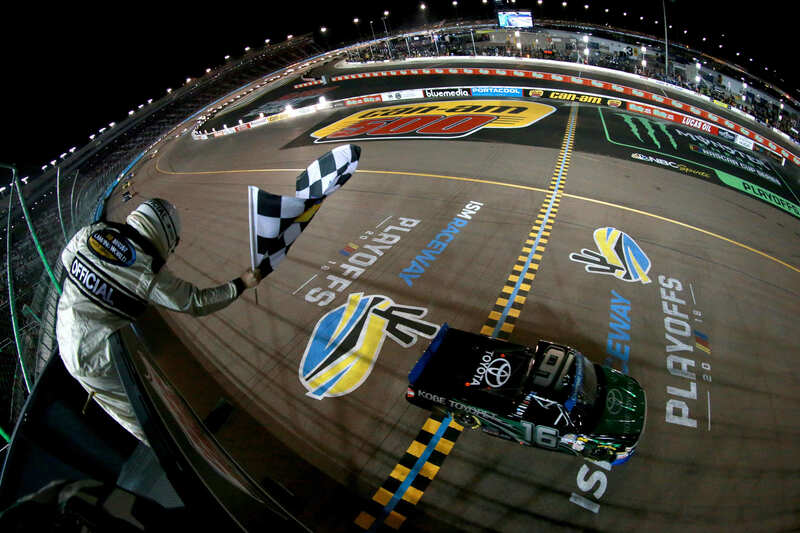 Brett Moffitt takes the stage 1 win at ISM Raceway! The field heads to the pit lane. Gragson pits too close to the inside wall, he has to backup. He slid through the box and made light contact with the wall. Moffitt is off 2nd with four tires. Penalty to Moffitt! He was speeding on pit lane and will go to the back. Burton and Haley will lead them to the restart. Green, Burton gets the jump on the inside lane. Crafton looks to the inside of Crafton. The field runs the apron in turn one! Lap 65, Matt Crafton is quickly closing on the leader. Harrison Burton leads by .5 seconds. The leader is working lap traffic. Friesen is another truck on the move. He’s running 3rd, plus 10 positions since the restart. 1 to go in stage two, Crafton is on the bumper of the leader. Crafton has a look on the outside into turn three. Burton runs wide off the corner to block the lane. Harrison Burton takes the win in stage 2 of the truck race at Phoenix! Moffitt climbed from the tail of the field all the way to 7th in that stage alone. The field heads for the pit lane. John Hunter Nemechek is the first truck to the pit exit with a two tire stop. Burton is off 2nd. Green flag on stage 3, Nemechek gets the jump. Enfinger surfaces in 2nd after working the apron in turn one. Lap 108, Grant Enfinger has climbed to the bumper of the race leader. He’s trying to race his way to a championship. Noah Gragson is closing on both of them. Three cars run nose to tail for the lead. Enfinger has to win this race to make the playoffs. He’s running 2nd and he’s two points under the cutoff line. Enfinger is on the bumper of the leader. 24 to go, Nemechek is loose off turn four! The leader is completely sideways! He corrects it, saves it and it snaps around again. Nemechek slides through the apron of the dog leg. Enfinger has been handed the lead. There’s fluid on the race track. The red flag is out for cleanup. Justin Haley leaked oil all over the race track. It’s going to be a 14 lap shootout! Green, Enfinger and Gragson wun side by side through the dogleg. Harrison Burton cuts the dogleg completely, he pulls even with Enfinger. The run three wide into turn one. Enfinger slides up the hill due to a narrow entry. Gragson takes the lead! Burton can’t get the power down off the corner. 10 to go, Gragson leads Enfinger by 2 seconds. Enfinger is 2nd and Moffitt is right on his bumper. Enfinger and Moffitt are battling for the final transfer spot to the NASCAR Playoffs! 8 to go, the caution is back out. There’s a truck around at the flag stand. Now, it’s going to be a three lap shootout! Green, Gragson spins his tires on the outside lane. Enfinger noses ahead on the bottom. Brett Moffitt cuts the entire dog leg. They run three wide for the lead into turn one. Enfinger slides up the track and bangers fenders with Gragson. Moffitt gets the power down on the apron through turn one. He takes the lead off turn two! 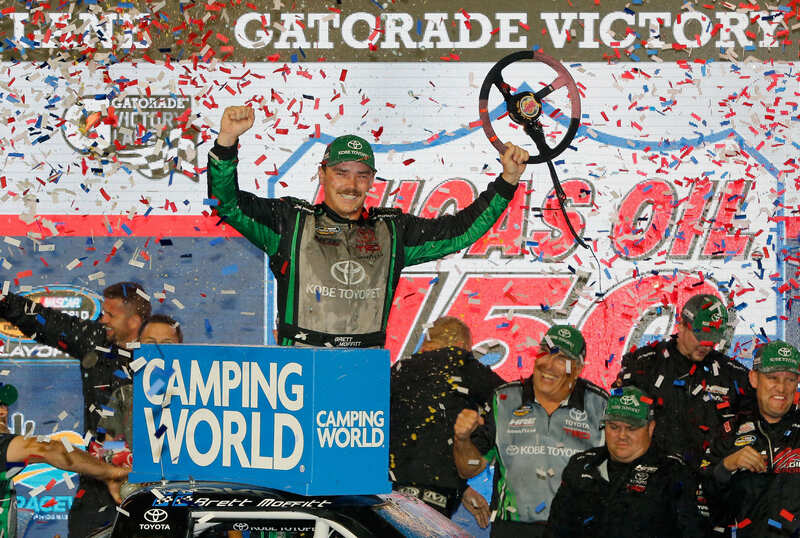 Brett Moffitt wins at ISM Raceway! He’ll go to Homestead! 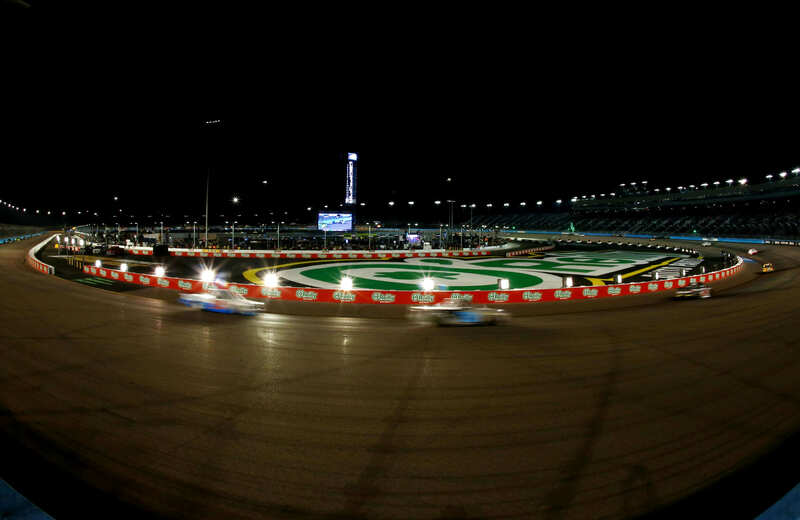 View full NASCAR Truck race results from ISM Raceway below.